Last month we reported that Atari had acquired the rights to a Postscript emulator for the SLM804 laser printer. This month we have even better news. Michtron has been quietly working on an Epson Driver for the laser printer and it's due out now! With GDOS, Epson and Postscript emulators now available for it, the Atari laser printer is becoming a very marketable product. You can make book on this: There will be a laptop ST before the first of the year! 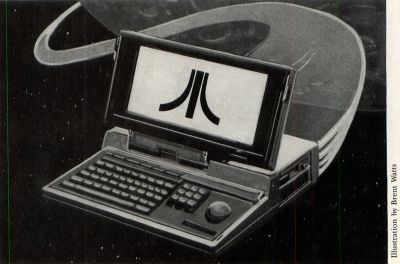 Several of my sources at Atari have confirmed that the LapTop ST has been moved up to No. 1 priority in the hearts and minds of the powers that be. The details are a little slim at this point but the fact that the LapTop is being developed on a very high priority basis is firm. Best guess on the configuration for the system is one meg in a 1040 style case with a fold-down screen and all the standard ports. Where Atari is going to put the power supply is the problem right now, all the supplies that Atari has looked at are either too large or the wrong shape to fit where the present 1040 power supply is located. More to follow on this as the picture becomes clearer. What's happened to the NeXT? It was less than a year ago that the computer market was waiting anxiously for the new Steve Jobs computer, the NeXT. Lately we haven't heard a word about it. This machine was scheduled to be a powerhouse with a high-resolution, 1280 x 640 RGB monitor, Postscript to both the screen and to print and four-meg of memory. A victim of the rising prices of chips? At Atari, the LapTop ST has been moved up to No. 1 priority in the hearts and minds of the powers that be. That Atari is planning to drop the 520 and 1040 computers in favor of the Megas. It is true however that some redesign work is being done on the packaging of all of the Atari computers. In fact we would expect that the first thing to be dropped from the Atari line will be the SF354 single-sided drive. That IBM has signed a deal with Walter (and that's the way it is) Cronkite to be a spokesman for their computers. Now as I understand it, Atari is talking with one of the lead characters from Star Trek, The Next Generation. Mr. Data as the new Atari Spokes (machine) person ? Mecion, the british Super Mini, uses the same transputer chips as the ABAQ. We learned at a computer seminar this week that they will also be using the same new operating system, Heilos, that the ABAQ will be using. Early reports are that the operating system is shaping up to be very powerful and will find widespread use among the European computer community. Have you seen the new Atari TV commercials yet? Wait, you will. Word is that Atari is using Federated Stores as a test site for marketing plans and sales staff-training programs, that will show up in the dealer-sales plans later this year. The transition is now complete, and there are no sources open to dealers for Atari Computers other than Atari itself. Cutting of the distributors was a painful and expensive step for Atari, but one that was necessary for them to maintain control of their products. They had promised dealers as far back as January 1986 that they would control mail-order sales to enable dealers to make a living margin on 1040s. Clearly they had not done this as of spring 1988, and dealers were dropping out as fast as new dealers were being added. Biting the bullet was necessary and, to their credit, Atari saw this and did it in spite of the howls from all sides (other than dealers). The results are beginning to show as the number of dealers rise again with fewer dropouts and many new dealers signing. Just as important, Atari now has profitable dealers to point to when signing up new dealers. See, you can make money selling the ST line of computers. Atari has been looking for some time now at a company that has designed a "Desktop" for the-8 bit line of Atari Computers. The product will be on the market, one way or another, but the expectation here is that Atari will be bundling it with new 130s in the near future. Loaded into a super cartridge, this graphics interface will allow the user to make selections with a mouse just as the current owners of Commodore can do with GEOS. Atari hopes that bundling this product will do as much for the 8-bits as it did for the Commodore 64. This (as I'm writing this) is the 456th day of the memory chip shortage with hopes that it will change RSN (real soon now). This year Atari will tell the masses that all those 65XE game systems they bought last year for Christmas are really computers. With thousands (well I guess there are still hundreds still being made) of titles available including things like word processing, spreadsheets, etc. What will they think of next? Smart dealers are loading up on disk drives and waiting for the rush.